Do you want to save or print a WordPress form entry in PDF? WPForms allows you to natively export a form entry as PDF for better ability to print it. In this article, we’ll show you how to export a WordPress form entry as PDF and print it without any hassle. 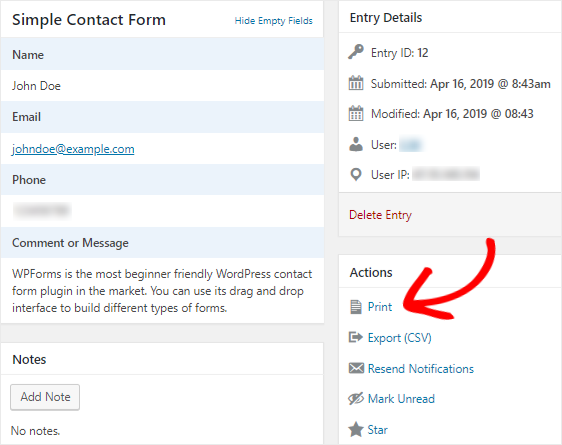 Why Print a WordPress Form Entry? For many users, exporting their form entries as a PDF file allows them to save or print the file. If you export an entry as PDF, you can even attach it to an email if you want. With WPForms, you can print a WordPress form entry with just a click. So let’s walk you through a step-by-step guide on printing a WordPress form entry. The first thing you need to do is to install and activate the WPForms plugin on your site. To get started, you can read how to install a WordPress plugin. Then, you’ll have to get a form created. WPForms allows you to create different types of forms like survey, complaint, parental consent, and almost anything you can think of. You can also check out our tutorial on how to create a simple contact form. And make sure you’ve some entries added to your form to follow this tutorial. 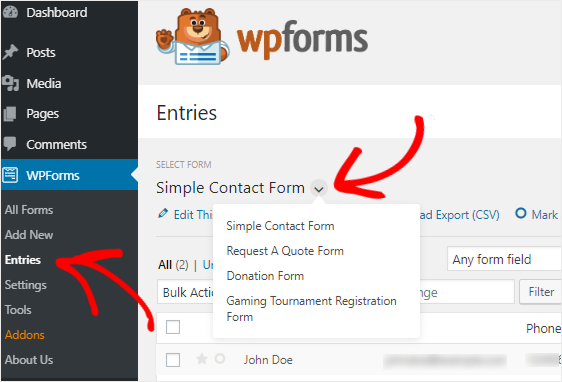 To print a form entry, go to WPForms » Entries. You’ll see the entries of one of your forms on this page. 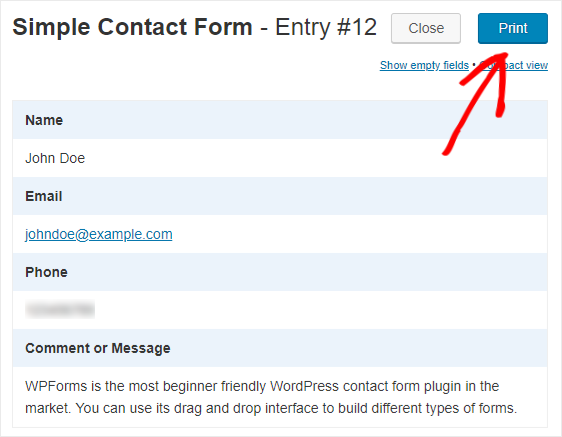 You can select a different form by clicking on the arrow icon present beside the existing form title. Now, to print a form submission, you need to open the individual form entry on a separate page. You can do that by clicking on the View link. The individual form entry page allows you to see every detail of that particular submission. You can also perform useful actions including exporting it to CSV. Now click on the Print option under the Actions section on the right side of your page. Clicking on it will direct you to a new page where you can view the form entry without any distraction. Then, click on the Print button to print this form submission. In Google Chrome, you can print the form entry if your device is connected to a printer. You can also save the file as PDF if you want. If you’re using another browser, you can use a tool like PDFCreator to print the form submission. That’s it! We hope this article helped you to print your WordPress form submissions to PDF. If you’re accepting payments on your site for a service, you can learn how to enable optional payment on your form. It would be good to have the ability to map form fields to places in pdf file. This way we could create a form that would fulfill contracts that user could download, print and send to our company. How to iclude section devider in print preview? Is there a way to setup wpforms to automatically print out new form entries as they come in? Hi Nick – We don’t currently have a way to automatically print form entries. In case it helps, though, you can automatically send out emails with the entry contents included or periodically create a CSV export (which could be opened in a spreadsheet program and printed from there). I apologize, but I’m not sure I understand what you’re looking for. When you get a chance, could you please contact our team with some extra details about what you’d like to be able to do? Is there a way to print multiple form entries in one batch? Right now, the best way to print a bunch of entries at once is with a CSV export (you can open the CSV in any spreadsheet program and print from there). Ok thanks. I need to be able to print the individual sheet. There’s no way to do a batch print of all entries though? We have to go one by one? Yes, that’s correct — we don’t currently have a way to print a bunch of entries all at once. I can definitely see how this could be a useful option, though, and I’ve added this to our feature request list for consideration down the road. If you have any additional questions, please submit a ticket — we’ll be able to reply faster from there 🙂 Thanks! Is it possible to attach a company logo to the top of the PDF? can a user print out his forms after filling in the front-end? Once the user receives an email notification after they’ve submitted the form, they can print it out via their browser if they’d like. It would be very helpful, when a form is submitted, to get a notification email with an attached pdf document including all fields. Is it something on your list?